Have you been to Louisiana? I've been to this state as far as Metairie when I had my appointment for greencard. 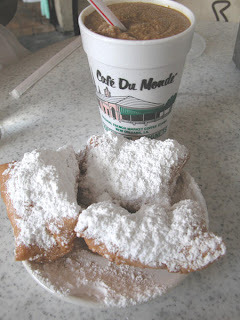 It was stormy but, when its' ceased, we went to New Orleans to have a cup of coffee and a beignets, my favorite at Cafe' du Monde. Right now, I miss beignet but, not so much with the coffee because you know why? Hubby bought 10 cans of Cafe du Monde coffee back to Florida. Bringing home the feel of French Quarter aroma.